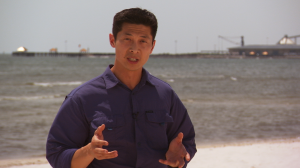 With Hurricane Isaac brewing in the gulf I headed to Gulfport, MS for NBC. I was excited to be covering another hurricane. 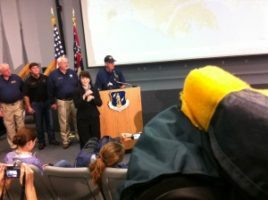 I certainly learned a lot from Hurricane Irene last year, which helped me prepare for this latest storm. Armed with a HDX 900, I got to work. NBC correspondent, Thanh Truong, does a live hit. I spent the first day on the beach all day. I know, I know, hard gig, right? We were ready for live hits by 5am. Our correspondent was NBC’s Thanh Truong. Since the storm was still a day away we barely did any hits. The next day things started to pick-up, as we became the “tape” crew. We shot a story on locals preparing their boats for the storm. Afterwards we fed the tape and then were put on stand by till the storm hit. Flooding happened almost immediately. We shot b-roll of the roads flooding and the National Guard tending to local’s needs. Later in the day we shot a press conference with Mississippi governor, Phil Bryant. After feeding more time we were cut for the day. Tomorrow is when things would really get interesting. Mississippi governor, Phil Bryant, does a press conference. Wind speeds picked up as Isaac officially made landfall in the middle of the night. The following morning we went out and scoped for damage. We then went over to an animal shelter and shot a piece on the shelter. After feeding tape we went back out and shot more damage footage. A tornado had just touched down a few blocks away from us so things definitely got a little intense. Houses without roofs and crushed cars were easy to find. We then followed local police as they made their rounds through the neighborhood making sure everyone was OK.
After a long day of covering the storm things started to settle down. Eventually we were “good nighted” and packed up. Both my audio guy and I had shoots the next day so we had to leave Gulfport that night and head back to Nashville. 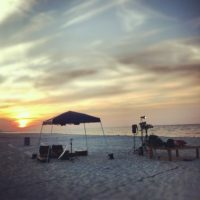 We had a great time in Gulfport. We got some great footage for NBC and even more importantly we made it back to Nashville safely. As always, I look forward to the next big storm. 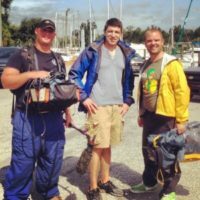 Matt Corn (audio guy), Matt German (producer), and I pose for a picture prior to Hurricane Isaac’s arrival.